¼ cup Macaroni, 1/2 Onion, ½ small carrot, 1/8 cup peas, 2 tablespoons of Oleev Active, 1 tablespoons of each Tomato ketchup, soya sauce, garam masala (optional) and Salt. Boil the macaroni and keep it aside. Add Oleev Active oil in a pan. Sauté onions. Add vegetable and salt and fry for few minutes. 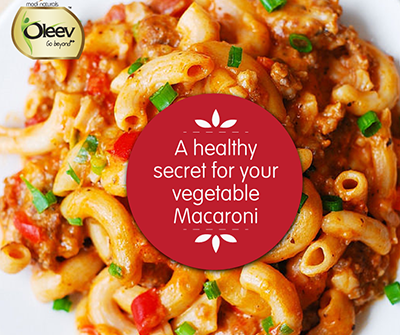 When vegetables are cooked add boiled macaroni along with seasonings.